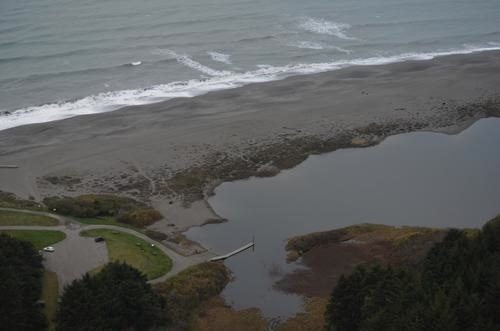 Coast Guard crews searched this area on Saturday, Nov. 24, 2012, for a 16-year-old male who was swept out to sea from the beach of Big Lagoon State Park in Humboldt County. Crews searched this area for hours by land, sea and air before the search was suspended on Saturday night. U.S. Coast Guard photo. MCKINLEYVILLE — The Coast Guard suspended its search for the 16-year-old who was swept out to sea from a beach near Big Lagoon State Park on Saturday. 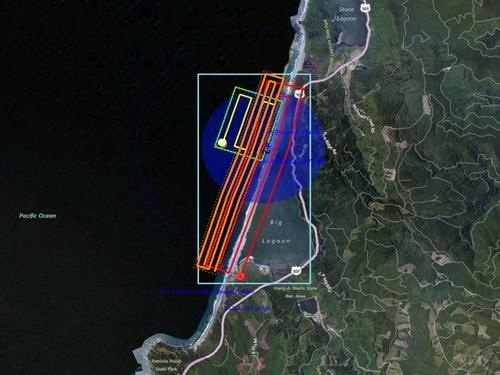 At 12:40 p.m. on Saturday, the Coast Guard received notification from the Humboldt County Sheriff’s department that three people had been swept into the ocean. Group Air Station Humboldt Bay dispatched an MH-65 Dolphin helicopter rescue crew and two 47-foot Motor Lifeboat crews from Station Humboldt Bay to search the area. The Coast Guard search patterns for a 16-year-old male who was swept out to sea from a beach near Big Lagoon State Park in Humboldt County, Saturday, Nov. 24, 2012. Crews searched more than 6 square miles around the Big Lagoon area looking for the person in the water. U.S. Coast Guard image. Upon arriving on scene, the Coast Guard was advised by the sheriff’s department that two bodies had been recovered, and that a 16-year-old male was still missing. Crews searched the six-square mile area around the state park by air and sea until suspending at 6:45 p.m. due to heavy fog and darkness. This entry was posted on Monday, November 26th, 2012 at 7:26 pm	and is filed under News. You can follow any responses to this entry through the RSS 2.0 feed.